Now that the assessment is complete I have created two programmes, the first programme that is relative to the findings. This programme has a few layers. Pre movement stretches, mobilizers and self myofascial release (SMR) exercises to inhibit over-facilitated muscles and lines of fascia an mobilize restrictions prior to exercise. 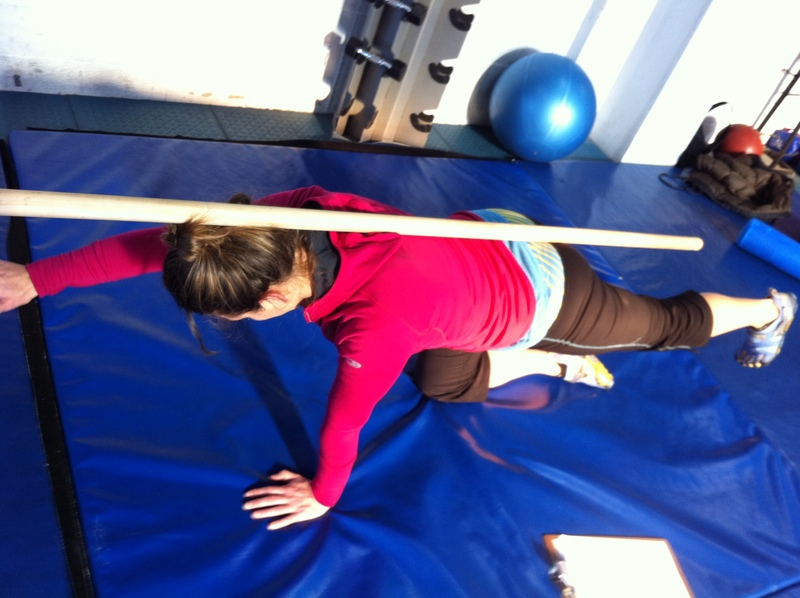 ‘Switch on’ exercises to facilitate under-facilitated muscles prior to movement. Alternating leg lifts for the ‘inner unit’. The goal is to maintain 70mm/Hg on the pressure cuff, its a lot harder than it looks! Most of these exercises are to be done daily to encourage biomechanical efficiency and get Helen on track as soon as possible. It is done regularly because ‘postural muscles’ respond well to this. The second programme focuses on larger compound movements and is relative to the functional tests performed in the assessment. There is focus on body awareness, proprioception and biomechanical correction along with maintaining the ‘flow’ of movement. 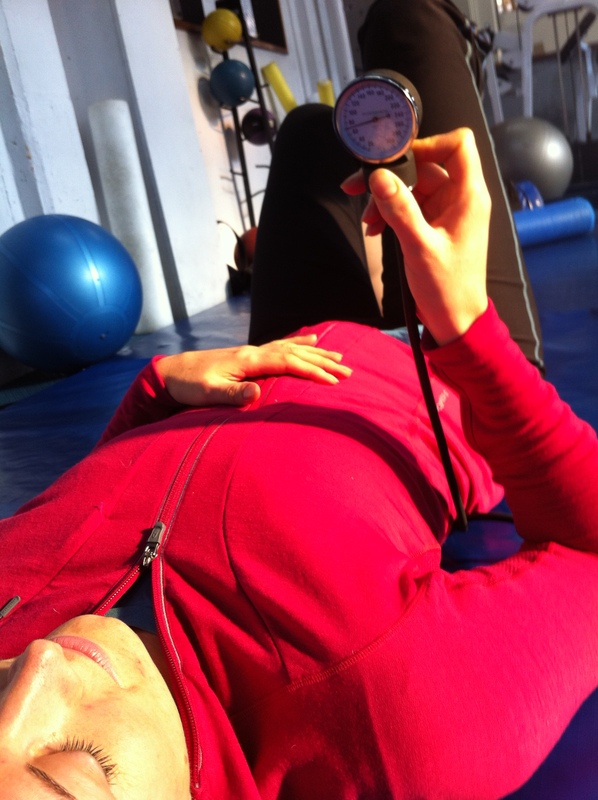 Because of the weakness of the Transverse Abdominus (TA) in compound movement I used a technique that encourages the ‘draw in’ movement of the naval during the exercises. This was done through asking Helen to activate her TA by drawing the belly button in, then tying a piece of string around her waist whilst in this position. This gives Helen feedback to whether she is drawing in or pushing out or no activation whatsoever. The string tightens around her waist if she is pushing out and the string remains loose if she draws in, the goal being to keep the string loose during the movement. We did however have some issues in getting Helen to activate her TA in neutral spine position and I find this problem arises with many people. When I gave the cue ‘draw your belly button in’ I instantly saw Helen round her lumbar spine and rotate the pelvis into a posterior tilt position. It took a while to correct but we got there and I think it will be something to keep an eye on for a while until it becomes automatic. On a larger scale a draft Periodized plan has been constructed to provide an outline of a training plan for an entire year. Currently we are in ‘preperatory phase’, the strength training is in the ‘anatomical adaptation’ phase and cardiovascular fitness wise the current goal is to build an aerobic fitness base. There are regular checkpoints in the plan with reassessment dates and measurable goals to meet also. The plan is slowly coming together but nonetheless it is coming together! Now the goal is to progress when appropriate, keep the communication lines open and make this work as a team! Next time we will talk more about the programming and how Helen is progressing.